President George W. Bush, an avid fisherman and outdoorsman, made a surprise appearance as keynote speaker Monday at the Tracker Marine Conference at Big Cedar Lodge on Table Rock Lake. The president’s father, President George H. W. Bush, addressed the same convention 20 years ago in 1994 in Springfield. 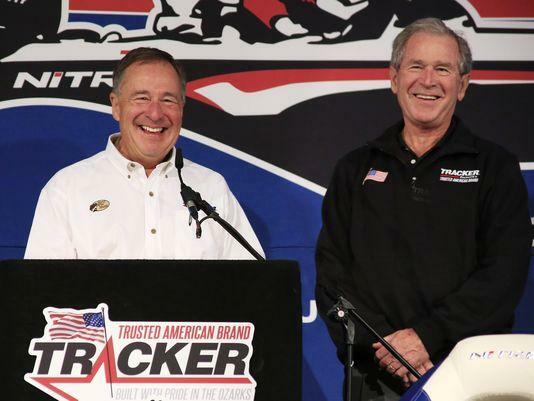 Bass Pro Shops Founder Johnny Morris presented Bush with Tracker Bass Force One, patterned after Air Force One, made at the Tracker plant in Lebanon. At the conference, Bush spoke about his administration’s work to protect water quality and natural resources. While in the White House, Bush restored, improved or protected more than 3 million acres of wetlands and created wildlife habitats through the North American Wetlands Conservation Act and other cooperative conservation efforts, according to a news release from Bass Pro Shops. “We pioneered a new model of cooperative conservation in which government and private citizens and environmental advocates work together,” said Bush, a longtime family friend of Morris. Morris praised the president for initiating many conservation efforts that helped protect wildlife habitats and water quality.